I loved my mom’s cooking. She had limited resources, but always managed to prepare delicious meals for our family and friends. I inherited her love of cooking and baking, and am a very lucky recipient of her hand-written recipes. She loved collecting and trying different recipes, as much as I do. The family tradition continues, as my daughter and granddaughter also enjoy culinary arts. 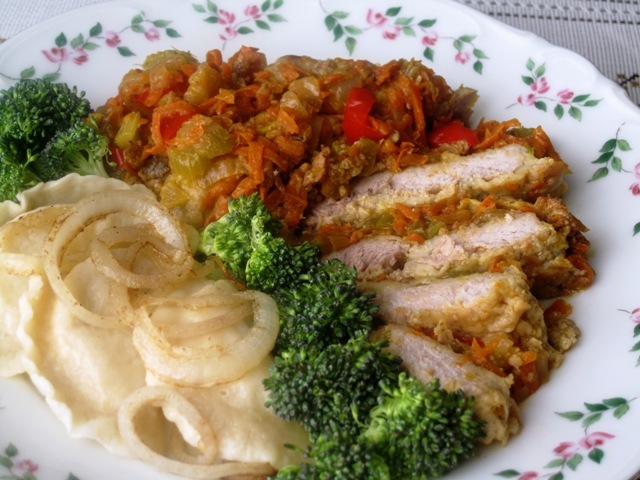 Today I will share her recipe for my favorite pork chops smothered with veggies, and served with home-made varenyky (pierogies). Wipe the meat with wet paper towel, place it on a cutting board, cover with a sheet of plastic wrap to prevent spatters. Use a meat mallet and pound the chops on both sides, to tenderize the meat. Set aside. Beat the eggs in a shallow bowl, garlic powder, paprika, and Italian Seasoning. In a paper plate place the flour mixed with salt and pepper. In another paper plate place the bread crumbs. Place a frying pan on the stove, and warm up 2 Tbs of Canola oil. Dip each pork chop in the flour mixture, then in the beaten egg mixture, then in the bread crumbs. Place them in the hot oil, and brown lightly on both sides, then set aside. Meanwhile, add the chopped onions to the pan, and saute until translucent. Mix in the carrots, celery and peppers with the onions. Line a large baking pan with aluminum foil, grease lightly with oil, spread the veggies over the bottom of the pan. Place the pork chops over the veggies. Sprinkle 1/2 cup of water over the chops. Cover the pan tightly with aluminium foil, and bake chops for 35 minutes. Uncover, and bake 10 minutes longer, to crisp up the chops. Remove from the oven, cool for 5 minutes, place the chops and veggies on a serving platter, and serve with your favorite side dish ( potatoes, rice, pasta), or varenyky (perogies), like my mom did.